White paper on crime 2004 Part1/Chapter2/Section2/3. Table 1-2-2-5 shows the number of visiting foreign nationals newly received by public prosecutors,by nationality for criminal cases(excluding professional negligence in traffic accidents and road traffic violation),over the last three years. Persons from China accounted for the largest share,and those from Asian region accounted for more than80%of the total for the last three years.In2003,China was45.0%,followed by South/North Korea(11.8%),the Philippines(6.3%),Brazil(6.0%),and Thailand(3.5%). Fig. 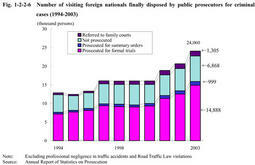 1-2-2-6 shows the number of visiting foreign nationals finally disposed by public prosecutors for criminal cases(excluding professional negligence in traffic accidents and road traffic violations)over the last10years.The number remained stable from1997to2000and have increased since2001.Suspects prosecuted for formal trials have risen remarkably,in particular. 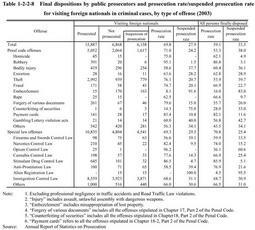 Table 1-2-2-7 shows the number of visiting foreign nationals finally disposed by public prosecutors,by type of offense,for criminal cases(excluding professional negligence in traffic accidents and road traffic violations)over the last three years. 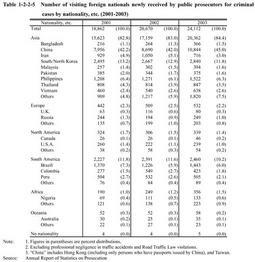 In2003,24,060visiting foreign nationals were finally disposed for criminal cases(up16.6%from2002),accounting for5.3%of the total disposed persons and78.1%of total foreign nationals finally disposed.By type of offense,of penal code offenses(8,248persons),theft had the largest share(54.9%),followed by injury(9.8%),embezzlement(5.7%),and robbery(5.5%).Of special law offenses(15,812persons),Immigration Control Law violations had the largest share(79.6%),followed by Stimulant Drug Control Law violations(4.9%).Drug offenses,including violations of Stimulant Drug Control Law,Cannabis Control Law,Narcotics Control Law,and Opium Control Law,accounted for about8.3%of total special law offenses. 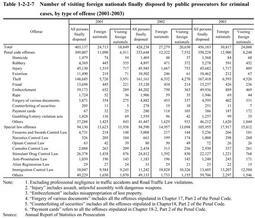 Table 1-2-2-8 shows final dispositions by public prosecutors for visiting foreign nationals in criminal cases in2003,compared with dispositions in all criminal cases.The prosecution rate for visiting foreign nationals was higher in penal code offenses and slightly lower in special law offenses.